Unfortunate as it is to loose a race car chassis due to accident damage as it is, all racing teams have to cater for that eventuality as motor racing is, after all full of risk and incident and the #95 Aston Martin Racing car's incident at Le Mans is no exception. 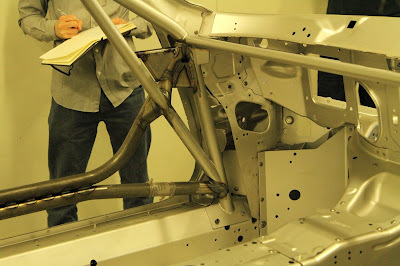 With the build time to complete a race car from this simple caracss still being nearer the 100 man hour mark, the team told us in March that chassis 15A-004-01 would be built up to a point from where it would just need the engine and running gear fitted - work than easily be done at the circuit and that this spare chassis would indeed travel with the team throughout the Super-Season. 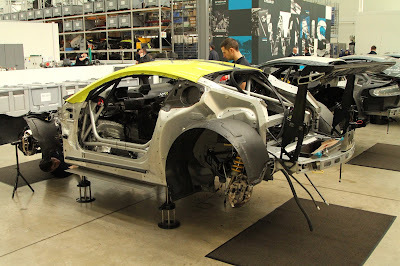 With the damaged chassis already back at the Prodrive factory, we expect that to be stripped down to see if anything is salvageable from which point it can either be repaired or not with possibly having chassis 15-001-01 (the now new GT3 testing platform) being made ready should they need it. 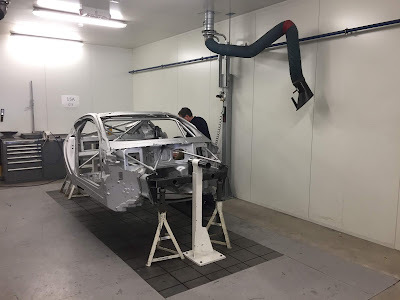 That original chassis is (according to Racecar Engineering) about to hit the track at the Goodwood Festival in its GT3 guise for the first time later next month and any cross converting of that chassis back to GTE form will delay the new GT3 programme release scheduled for the end of the year. There are reports that Aston Martin Racing will shakedown test a repaired car (or two) as early as tomorrow (Tuesday).